Address: NTS Headquarters, 96, Street No.4, Sector H-8/1, Islamabad. 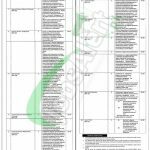 For the residents of Punjab, we provide here Punjab Information Commission Jobs 2019 Application Form Download | nts.org.pk. A reputed Government Department working under the Government of Punjab named as Punjab Information Commission has announced the latest job opportunities for the Punjab Domiciled who are welcome to apply for the following positions given below. Jobs to apply are such as (Executive Director, Deputy Director (Admin & Finance), Deputy Director (Programs), MIS Manager, Assistant Director (Awareness & Trainings), Assistant Director (Research & Publications), Assistant Director (Law & Complaints), Network Administrator, Private Secretary, Superintendent, Web Master, Assistant, Accountant, Stenographer, Data Entry Operator, Junior Clerk). Candidates having a qualification such as MPhil/Ph.D./Masters/Bachelors in the relevant discipline and having relevant skills and experience as per the demand of job are eligible to apply. For more requirements please examine for the following image posted below. So, guys what you are waiting for read the following instructions carefully and apply as soon as possible. Applicants are required to apply on the prescribed application form available at www.nts.org.pk or at www.jobsalert.pk. List of eligible candidates will be uploaded at nts.org.pk before the one week of NTS test. Address: NTS Headquarters, Plot No. 96, Street No. 4, Sector H-8/1 Islamabad.